Friends of Water has been helping homeowners and pool companies keep their pools, spas, and hot tubs chemical free and safe to enjoy since January 2006. These pool filters use a natural system to filter pool water through a series of Power Disks. The result is excellent, clean, chlorine-free water for swimming pools – through filtration rather than through chemicals. Chlorine attacks organic matter; your body’s largest organ is your skin! Chlorine irritates eyes, noses and lungs and it leaves skin and hair dry and flaky. Moreover, how often do you have to replace bathing suits because chlorine fades and wears them? Studies have shown that long-term exposure to chlorine can be harmful to your health. We absorb more chlorine through the skin than we do through drinking water. Hydrogen peroxide alternatives to chlorine can cause allergic reactions and can permeate the pool walls. These FOAM ADVANTAGE Natural Pool Filter Systems clean water with a state-of-the-art form of KDF® copper-zinc media which has been molded, via a proprietary process, into a hard disk that looks like a gold sponge. KDF is excellent at removing chlorine for long periods while also maintaining a bacteriostatic environment in the filter. These filters meet NSF Standards 42 and 61 and have been tested to remove heavy metals and inorganics as well as chlorine from water. In other words, they’ll do what you need done. The filters release low residual copper and zinc ions into the water, which prevents algae and fungus growth. Filtration inside the pool system takes place as the water twists and turns through the filter’s maze of copper-zinc fibers. This motion increases contact time with the disks as the water is continually circulated through the openings. Because the reticulated foam media is hard, it cannot be compacted, and the filter is not subject to channeling or clogging. No backwashing of these filters is necessary. 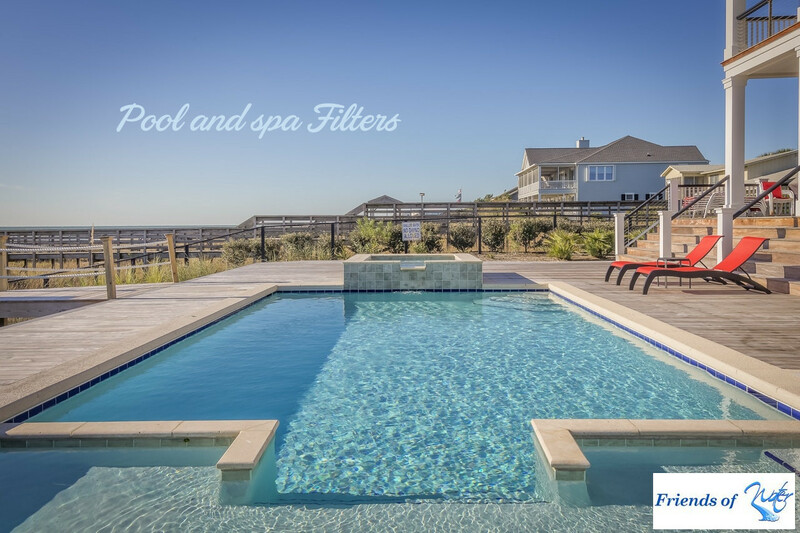 These natural pool filter systems use an all-natural process that works by catalytic action and the reduction/oxidation principal of dissimilar metals. As water passes through the Power Disks, a chemical reaction causes zinc and copper hydroxides to form in controlled amounts. These controlled releases of copper and zinc oxides are carried into the filtered water where they kill bacteria and provide hostile conditions for algae and fungus growth. This also means less time and work to keep the pool water clean and natural. These pool filters also safeguard the pool’s plumbing and equipment because pipes are protected against the corrosive effects of chlorine. Your chemical costs will become minimal. The 30,000 gallon pool system uses 12 disks. The 15,000 gallon in-line natural pool system uses 6. This technology allows at least six to eight months use before the disks need to be replaced. Most people have found that they last longer than that. The FOAM ADVANTAGE natural pool filter technology makes refilling as simple as dropping out the old disks and popping in the new! Fittings can be equipped with 2″ or 1 1/2″ sizes, just let us know when you order. There is the usual 90-day return for any reason from Friends of Water. There is an additional manufacturer prorated guarantee on the housing for two years.